Sheffield City Region Enterprise Zone (EZ) sites have attracted 1,100 jobs in total. The EZ includes a number of key employment sites in Rotherham such as areas of the Advanced Manufacturing Park (AMP) and Templeborough and in 2014, 15 hectares at Dinnington were added. Companies located in the zone are benefiting from simplified planning rules and tax breaks for businesses. One of the main benefits that the zones offer a business rate discount worth up to £275,000 per eligible business over a five year period. All business rates growth within the zone for a period of at least 25 years will be shared and retained by the Sheffield City Region, to support the Local Enterprise Partnership's economic priorities and ensure that Enterprise Zone growth is reinvested locally. Companies in Rotherham benefiting from business rates relief include Xeros, Struers, Carbolite, Arrow Technical and many cutting-edge occupiers in the AMP Technology Centre. 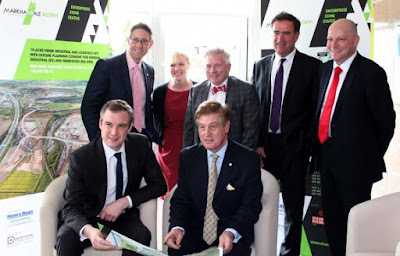 James Wharton MP, Government Minister for Local Growth and the Northern Powerhouse, met with Sheffield City Region leaders at the Markham Vale Enterprise Zone site this week. James Newman, Chairman of Sheffield City Region Local Enterprise Partnership (LEP), said: "Our Enterprise Zone sites are a key part of the Sheffield City Region's ambitious ten year Growth Plan and I'm pleased that our successes have attracted the attention of the new Northern Powerhouse Minister. "The Zone is a real hotbed for modern manufacturing and technology businesses and has seen a number of investments at the Advanced Manufacturing Park and at Sheffield Business Park – home to the stunning new Factory 2050 development." When launched in 2011, it was expected to generate up to 12,600 jobs and over 400,000 sq m of floor space for 250 businesses by 2015. When complete, it could reach 20,000 jobs, 400 businesses and £20m a year in new business rates from over 600,000 sq m of floor space.